Home > Health Care, Food, Beer, Retail, Tobacco > Medical, Health Care, Drugs > Covance Inc. 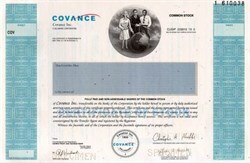 Beautifully engraved specimen certificate from the Covance Inc. . This historic document has an ornate border around it with a vignette of a woman and two men standing around a globe. This item has the printed signatures of the Company’s Chairman/CEO and Corporate Vice-President/General Counsel/Secretary. Covance Inc., with headquarters in Princeton, NJ, is one of the world's largest and most comprehensive drug development services companies with 2000 proforma revenues of $737 million, global operations, and more than 7,100 employees worldwide. Covance's purpose is to lead advancements in drug development through science, service, and shaping solutions.